No single figure embodies Cold War science more than the renowned physicist J. Robert Oppenheimer. Although other scientists may have been more influential in establishing the institutions and policies of the nuclear age, none has loomed larger in the popular imagination than the “father of the atomic bomb.” Americans have been drawn to the story of the Manhattan Project Oppenheimer helped lead and riveted by the McCarthy-era politics that caught him in its crosshairs. Journalists and politicians, writers and artists have told Oppenheimer’s story in many different ways since he first gained notoriety in 1945. 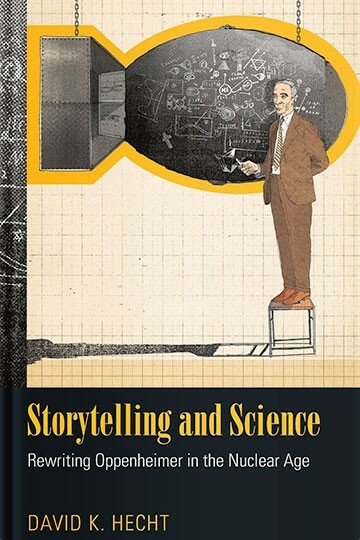 In Storytelling and Science, David K. Hecht examines why they did so, and what they hoped to achieve through their stories. From the outset, accounts of Oppenheimer’s life and work were deployed for multiple ends: to trumpet or denigrate the value of science, to settle old scores or advocate new policies, to register dissent or express anxieties. In these different renditions, Oppenheimer was alternately portrayed as hero and villain, establishment figure and principled outsider, “destroyer of worlds” and humanist critic. Yet beneath the varying details of these stories, Hecht discerns important patterns in the way that audiences interpret, and often misinterpret, news about science. In the end, he argues, we find that science itself has surprisingly little to do with how its truths are assimilated by the public. Instead its meaning is shaped by narrative traditions and myths that frame how we think and write about it.